Capriccio showing a domestic building of three bays with doorway flanked by narrow lancet windows, with a long relief panel and thermal window above. To one side is a small wing with tiled roof. In the foreground are three figures, with trees in the background. 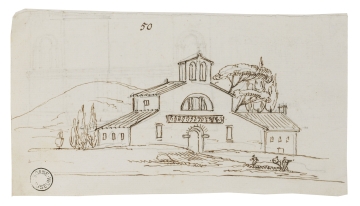 You are here: CollectionsOnline / Capriccio showing a domestic building of three bays with doorway flanked by narrow lancet windows, with a long relief panel and thermal window above. To one side is a small wing with tiled roof. In the foreground are three figures, with trees in the background. Unfinished pen capriccio showing an elevation with colonnade on rusticated basement, with pavilion towers and a thermal window. The type of domestic building shown here incorporating antique fragments is typical of several of Robert Adam's landscape compositions. Similar compositions can be found in the landscape section of volume 54 (see Adam vol.54/Series 5/10).